Use the 3-wire resistance method, as shown in the following figure, to measure resistance on resistors that have three lead wires. 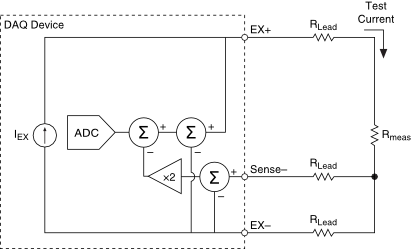 The 3-wire method uses three test leads, one pair for the excitation current (Ex+, Ex-), and a third wire (Sense-) to compensate for the lead wire resistances. The third wire measures the voltage developed over the lead resistance in the Ex- leg of the excitation current path. By subtracting its value from the overall differential signal, the device can compensate for parasitic lead resistances in the Ex+ leg. However, this would only compensate for lead resistance in the Ex+ leg and not in the Ex- leg. To compensate for lead resistance both in the Ex- leg and in the Ex+ leg, the device approximates the Ex+ leg by assuming the voltage is the same as in the Ex- leg. Thus the voltage between Sense- and Ex- is multiplied by two before being subtracted from the overall differential signal. This method works well when lead resistances in the Ex+ leg match resistances in the Ex- leg. Some legacy devices do not provide compensation. In that case, you need to specify the lead-wire resistance so that it can be subtracted in software.